Thousands of years ago many people believed in a god named Zeus. He was considered to be the god of the sky and weather and his image appeared on most Greek coins. The people of Greece worshipped this idol as their god. Zeus became one of the Seven Wonders of the World. Phidias, a famous Greek sculptor and his laborers carved a giant statue of Zeus in a special workshop behind the temple. It was made entirely of ivory and gold (Chryselephantine). When finished it sat in the temple on an elaborate throne along with sculptures and paintings of Greek myths and legends. 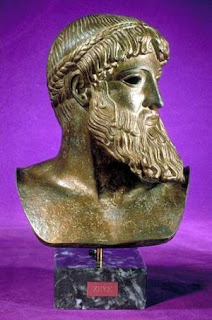 Zeus was the most celebrated statue of ancient times because of its greatness, charm and worth. Zeus was the supreme god and ruler of Olympus. He was known by many titles: Lord of the Sky, the Cloud- gatherer, the Rain-god and Zeus the Thunderer, all of which show which force of nature was considered to be the most important in Ancient World - rain. In most other mythologies the "ruler-god" was usually associated with the sun, but in Greece the climate is hot and dry making rain the scarce, life-giving force. Zeus was the sixth child born to Cronus and Rhea, Because Cronus, ruler of the Titans and the supreme god at the time, was afraid that one of his children would overthrow him, just like he overthrew his father, Uranus, he swallowed his first five children - Poseidon, Hades, Hera, Demeter and Hestia. This, of course, infuriated Rhea and when Zeus was born she tricked Cronus into swallowing a rock wrapped in blankets. 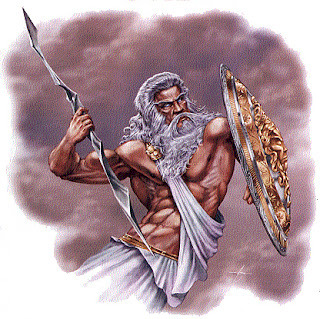 Zeus is more powerful than any other god or even all the other gods combined. But, unlike many gods in other religions he was neither omnipotent nor omniscient. He could be, and in fact was, opposed, deceived and tricked by gods and men alike. His power, although great, was not boundless, Zeus had no control over The Fates and Destiny. Like all Greek divinities, Zeus was subject to pleasure, pain, grief, and anger, but he was most susceptible to the power of Eros - love, which often got the objects of his desire in a lot of trouble with his wife, Hera. Zeus was mighty, glorious, awesome and wise, although he did show a certain degree of surprising foolishness and naiveness when it came to hiding his love affairs. Some historians attribute this less than noble behavior of the "noblest one of all" to the fact that Zeus was most likely a compilation of many "supreme gods" from different areas. When his worship spread to an area which already worshipped another god, some of that god’s qualities as well as his wife or lover were transferred to Zeus. Aside from the endless affairs Zeus was different from other gods in that he did not participate in the arguments and the resulting petty scheming that made up the daily activities of other gods. Being this wise ruler, he also demanded just and righteous action from men. Zeus was however vengeful, as can be seen in The creation of man by Prometheus, but only rightly so. Zeus had two special attendants, Nike (Victoria), the goddess of victory, and his cup-bearer, Hebe, who was one of his numerous daughters. After Hebe married Heracles, Ganymede replaced her as the cup-bearer for Zeus. In Roman Mythology, Zeus’ counterpart, Jupiter, was also attended by Fama (fame) and Fortuna (luck and chance, Tyche in Greek). Zeus was the guardian of political order and peace. The aegis is his breastplate - so glorious and at the same time awful to behold that no human could see Zeus in all his magnificence and survive. His weapon is, of course the thunderbolt which he hurled at whoever displeased him. The thunderbolts were fashioned for him the three Cyclopes who also were the deciding power in the battle with the Titans. His bird is the Eagle, his tree - the Oak. Dodona was his oracle. His will was revealed by the rustling of oak leaves which was interpreted by his priests. Hera was Zeus’ wife. She was brought up by the Titans Ocean and Tethys, despite the nickname "cow-faced" (in some translations - "ox-eyed") which seems to have stuck with her through the ages, she was very beautiful, in fact she was one of the three contestants in the Judgment of Paris which led to the Trojan War. But her personality was not as attractive, she was petty and cruel and is most often shown administering some sort of revenge on one of Zeus’ lovers. In one, and only one, myth is shown as a noble and gracious protector of heroes and inspirer of heroic deeds, the Quest of the Golden Fleece. As might have been expected Hera’s marriage to Zeus was not to her liking, after Zeus had courted her unsuccessfully for some time, he turned to trickery. Changed himself into an injured bird, Hera, feeling sorry for it, held it to her breast to warm it, Zeus, taking advantage of the situation raped her. She then married him to cover her shame. Zeus was anything but a faithful husband, so Hera, in her turn was not a loyal wife. Once she even convinced the other gods to join in a revolt against Zeus. Her part was to drug Zeus, and in this she was successful. The gods then bound the sleeping Zeus to a couch taking care to tie many strong knots. They had not, however, planned what to do next and began to quarrel over who would take Zeus’ place. Briareus overheard the arguments, still full of gratitude to Zeus, he came to his help and was able to quickly untie the many knots. Zeus sprang from the couch and grabbed his thunderbolt. As the gods fell to their knees begging and pleading for mercy, he seized Hera and hung her from the sky with gold chains. She wept in pain all night but, none of the others dared to help her. The weeping kept Zeus up and the next morning he agreed to release her if she would swear never to go against him. She had little choice but, to agree. While she never again rebelled, she often intrigued against Zeus's plans and she was often able to outwit him. Hera was the goddess of marriage and protector of married women. Her sandals, chariot and throne were all of pure gold, but that was not uncommon with the gods. Her animal is the cow, the peacock, and sometimes the cuckoo. Hera had her own messenger - the fleet- footed Iris (rainbow). Argos and Sparta were her favorite cities. She had no distinguishing features and can only be identified in artistic representations by either inscription or context. Zeus held a scepter with an eagle on top in its left hand and a winged goddess of Victory (Nike) in its right hand. The flesh was made of ivory with gold drapery covering the image. The Olympians declared Zeus their protector and claimed he presided over the gods on Mt. Olympus in Thessaly. Once every four years the Olympians held a festival including games to honor their god. Today nations still meet for the Olympic games but not to honor Zeus. The ability of the athletes themselves are considered and rewarded. Legend tells that Zeus was the youngest son of the Titans, Cronus and Rhea. He overthrew his father, Cronus and drew lots with his two brothers, Poseidon and Hades to see who would take Cronus' place. Zeus won and became the supreme ruler of the gods. His weapon was a thunderbolt and he generally showed compassion but handed out severe punishment to the wicked. Zeus had a number of wives who bore him many children. 1. Metos (wisdom)- was his first wife and she bore Athena. 2. Themis - bore Dike, Eirene, Eunomia, Horae, and Fates. 3. Titaness - bore nine children who became the Muses. 4. Leto - bore the twins, Appolo and Artemis. 5. Hera - became his permanent companion. Zeus was known for having numerous affairs with mortal women producing even more children including Hercules. Zeus was called the master of the gods, and "father of men." The title may be more impressive than meritorious; it seemed applicable to the Zeus of the philosophers who regarded him as a supreme god and sculptor of the universe. The notion was not primitive; Zeus was master of men as Agamemnon was the half-imposed, half-elected king of the Achaeans. Within this capacity he was the guarantor of contracts, oaths, the protector of guests that was involved in the human activity unfolding beneath his vigilant gaze. The mighty deity was thought to be god of the sky and master of the celestial fire, a side of Zeus' personality that the Homeric verses amply portrayed. As "king" of heaven he exercised a sort of providence; but his will was held in check by the immutable laws of fate, and his rule was often limited by these laws and respected. Although inhibited by this restriction, Zeus could govern and follow a policy; his decisions were rarely arbitrary or set forth with passion; they corresponded to hidden intentions, the wisdom of which was ultimately revealed. He was the ultimate dispenser of good and evil to all mortals. Zeus was the son of Cronus and his sister, Rhea. Also from this relationship had came Hestia, Demeter, Hera, Hades, and Poseidon. But a curse had been put on Cronus, who being of a dishonest and violent nature, when he refused to plicate Gaia after he had turned his father off of the thrown. Instead of setting free his brothers, condemned by Uranus never to see the light of day, Cronus kept them shut away in their subterranean prison, which enraged Gaia. Gaia vowed that he would know the very fate that he had put upon his father by being dethroned by his own children. So in order to protect himself from this curse he devoured his offspring as soon as Rhea bore them. The first five he swallowed, but when Zeus was born Rhea decided to save the child. With Gaia's help she found shelter in a Cretan cave where she delivered the infant. Then taking a stone Rhea wrapped it in swaddling clothes and took it back to Cronus, who, without question, seized it and swallowed it. Zeus had been saved, and with the same stroke Cronus sealed his own fate. The young Zeus grew from infancy in the cave being nursed by the nymphs of Amalthea, and protected by the Curetes, which mean "Young men," who were warriors with spears and shields that performed a war dance around the grotto. This was to drown out the infant's wailing so Cronus would not discover that he had been tricked and devour his son. In this instance, it appears, as frequently happened, the myth grew from a rite: a ritual war dance was practiced in Crete, also in other Hellenized countries, by people imitating the supposed actions of the spirits of the storm in the mountains and sky; such dancing probably gave rise to Rhea's ruse. While being protected Zeus matured receiving all of his divine powers. When the time came for Gaia's prophecy to be fulfilled Zeus consort was Metis, a daughter of Oceanus, whose name means "Prudence" or more often "Perfidy." She gave him a drug that would make his father vomit up the five children that he had previously devoured and still carried in his body. They all emerged, and with these allies Zeus attacked Cronus and his comrades, the Titans. The war in which they battled each other lasted ten years. Finally, Gaia's oracle promised Zeus victory if he would accept help from the monster that Cronus had imprisoned in Tartarus. Zeus agreed, thus permitting Gaia's wish that Cronus disregarded. Zeus delivered the monsters and was victorious. Accounting for this victory were the weapons that the monsters gave to the young gods that in the future would bear their emblems, which included the thunderbolts that the Cyclopes forged for Zeus. Cronus and the Titans were then confined in the depths of the underworld and took the place of the monsters who became their guards. Hesiod's Theogony, written shortly after 700 BC, relates the most accepted tradition regarding the birth and childhood of Zeus. But there were others: Arcadia in particular prided itself on having been the cradle of this god. It became easy to deduce the past-Hellenic Zeus was formed by absorbing many local "great gods." For example, in Crete itself Zeus probably replaced a vegetation god, since the Cretans exhibited a "tomb of Zeus," and few but vegetation deities were believed to be subject to periodic deaths and rebirths. Zeus, the supreme sky-god of the Greeks and a composite figure, was believed to be involved in the daily affairs of people, but was never thought of as a creator deity. As Hesiod notes, the origins of things were related in other myths concerning Ouranos, the sky, and Gaia, the earth. The Dorian invasion of Greece around 1200 BC resulted in the superimposition of the Indo-European sky father cult on an indigenous Minoan-Mycenaean tradition in which the earth goddess was predominant, just as in India the Aryans submerged the Hindus valley culture. Even though traces of pre-Greek tradition are seen in Hera being the wife of Zeus, it was he as Nephelogeretes, "the cloud gatherer," who reigned over all things. He was given other names as well that depicted his different aspects and functions; they included Ombrios, "rain god"; Kataibates, "the descender"; Keraunos, "lightening"; Gamelios, "god of marriage"; Teleios, "giver of completeness"; Pater, "father"; and Soter, "savior." Hades, the god of the dead, and Poseidon, the god of the sea, were distinguished from Zeus because their powers were seen as extensions of his in their special realms. They were granted separate mythical forms, yet the writ of the Olympian Zeus, "the wolfish," Lykaios, ran everywhere, and he alone judged the winners and losers. In a similar tradition established by his father, Cronus, Zeus soon took a divine wife. Hesoid says his first wife was Metis, and from this union Athena was born. His second wife was Themis, the incarnation of law or equality. The first offspring was Horae (the Hours or the Seasons). The Horae were three in number: Eunonia, Dice and Eirene (Order, Justica and Peace), but the Athenians knew them as Thallo, Auxa and Garpo. Their names evoked the principle stages of vegetation: the plant's spouting, growth, and fructification. However, the agricultural aspects of the cults gradually took on social concepts, and the spirits who principally presided over the land were transformed into social concepts pertaining to city life. Then came three daughters known as the Fates or Morae: Clotho, Lachesis, and Atropos who determined the destiny of every human being. This destiny was symbolized by a thread, which the first Fate drew up from her distaff, the second Fate wound, and the third Fate cut at the end of the lifespan that it represented was over. Zeus' third wife, Eurynome, bore him three more daughters, the Graces (Charites): Aglaia, Euphrosyne, and Thalia. Similar to the Horae the Graces were vegetation spirits and spread the joys of nature in the hearts of men. They lived on Olympus, together with the Muses, with whom they loved to sing and dance. Like the Muses they were companions of Athena and presided over her feminine tasks. After this Zeus was companion with his daughter Demeter from which union Persephone was born. Then he attached to Mnemosyne who bore him nine daughters, the Muses. Leto was his next wife who bore Zeus Artemis and Apollo. Next the god Hermes was born to Maia, daughter of Atlas. Last in line of Zeus' divine wives was Hera, his sister, who bore him a son Ares, the god of war, and two daughters: Hebe, who personified youthfulness, and whose task for a long time was to serve nectar at celestial banquets until she became the wife of Hercules; and Eileithyia, the female spirit presiding over childbirth.